Our 3DDiscovery™ and BioFactory™ bioprinters offer a broad portfolio of biomaterials for both soft and hard tissue engineering and drug discovery. This portfolio is comprised of natural and synthetic hydrogels acting as extracellular-matrix environments to support cell growth (ECM-BioInk™), biomaterials for scaffolding to mimic hard tissues (OsteoInk™) and support materials (STARK™). 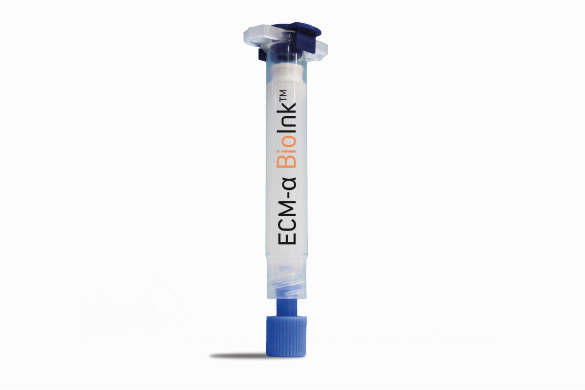 ECM-BioInk™, is a peptide nanofiber 3-dimensional scaffold that promotes cell growth and migration. It utilizes specific peptides that self-assemble from ECM-BioInk™ fluid precursors into highly intertwined hydrated peptide hydrogel fibres when presented with ionic strengths. By inducing a rapid transformation from solution to gel, a peptide nanofiber scaffold is generated. The ECM-BioInk™ portfolio contains 5 formulations that differ from each other in the electrical net charge which impacts the matrix stiffness and consequently cell proliferation capacity. OsteoInk™ is a ready-to-use calcium phosphate paste for scaffolding and structural engineering. 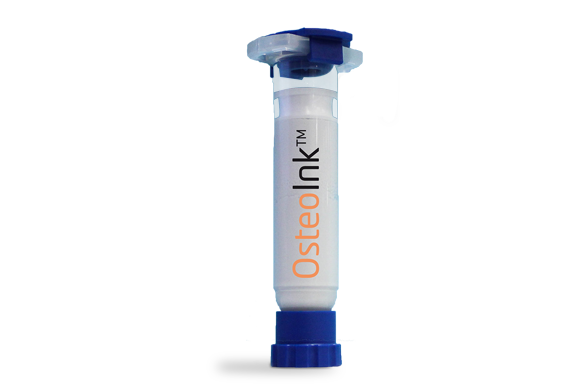 OsteoInk™ is a highly osteoconductive biomaterial close to the chemical composition of human bone. 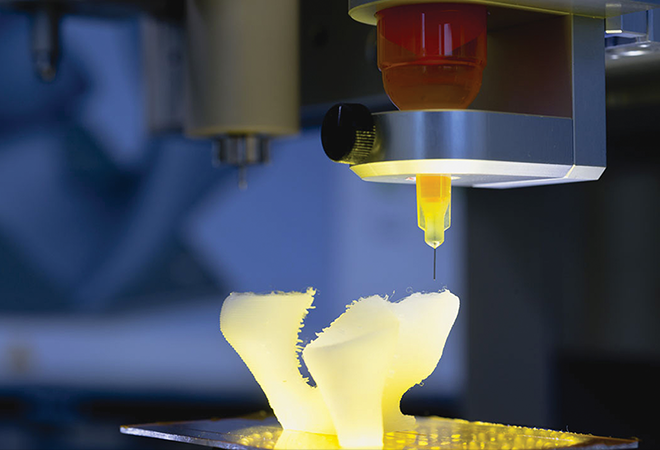 Dedicated to hard tissue engineering such as bone, cartilage or structural scaffold manufacturing, OsteoInk™ can be combined during the printing process with our biomaterial product portfolio (e.g ECM-BioInk™) to create complex 3D tissue models. 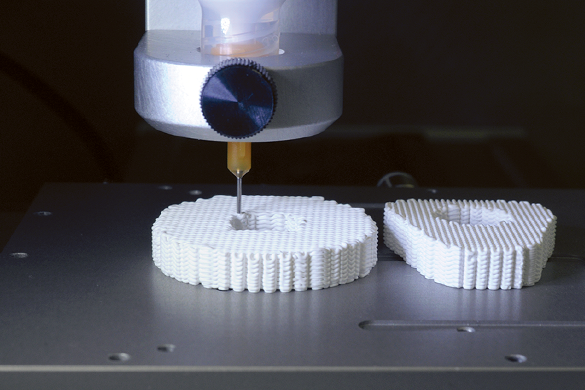 The uniqueness of BioFactory™ and 3DDiscovery™ printers enables freeform fabrication of tissue models with controlled layers, pore structure and biological composition. It enables scientists to mimic nature by combining OsteoInk™ with hydrogels (natural or synthetic), bioactives, scaffolding or support materials. BioInk™ is a chemically-defined hydrogel to support growth of different cell types. It allows cell adhesion, mimics the natural extracellular matrix and is biodegradable. 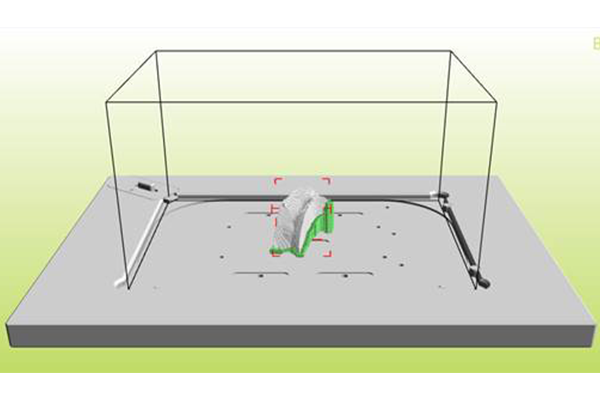 BioInk™ is provided as a ready-to-use chemically-defined hydrogel to print 3D tissue models. Exclusively designed for regenHU’s BioFactory™ and 3DDiscovery™ tissue and bio-printers. A versatile, chemically-defined hydrogel, supporting cell attachment, growth, differentiation and migration. The BioInk™ is suitable for long-term tissue cultivation (in vitro human dermis for up to 7 weeks). Combined with BioFactory™ or 3DDiscovery™ tissue printers, you will be able to create composite tissue models in a layer-by-layer fashioning with spatial control of bioactive components (matrix, cells, proteins) and biomaterials. Creation of tissue models of complex bioarchitectures and overhanging structures, in single or composite materials, may require fugitive support materials that act as a temporary scaffold for the structure. Especially in 3D cell culture & LifeScience applications where extracellular matrix materials (ECM) such as low-viscose hydrogels, collagens or similar are used to encapsulate and deliver bioactives, STARK™ biopolymer enables 3D shape fidelity and bioarchitecture control of cell-laden conceptions. STARK™ is a biocompatible biopolymer dedicated to hard & soft tissue engineering with either a 3DDiscovery™ or BioFactory™ bioprinting platform. It can be used during the construction process in combination with BioInk™ or OsteoInk™ or any natural or synthetic printable biomaterials.